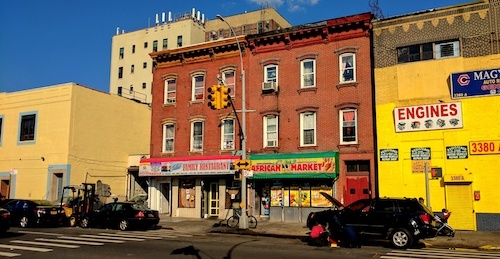 It appeared that the representation of Sierra Leone with its own Bronx restaurant had ended a few years back when B&B African & American Restaurant on Webster Avenue changed hands and chefs to folks from Guinea and become Adaya ML. This was only true for non-West Africans from outside of the area though, as Jalloh Family Restaurant has been around for at least 10 years. 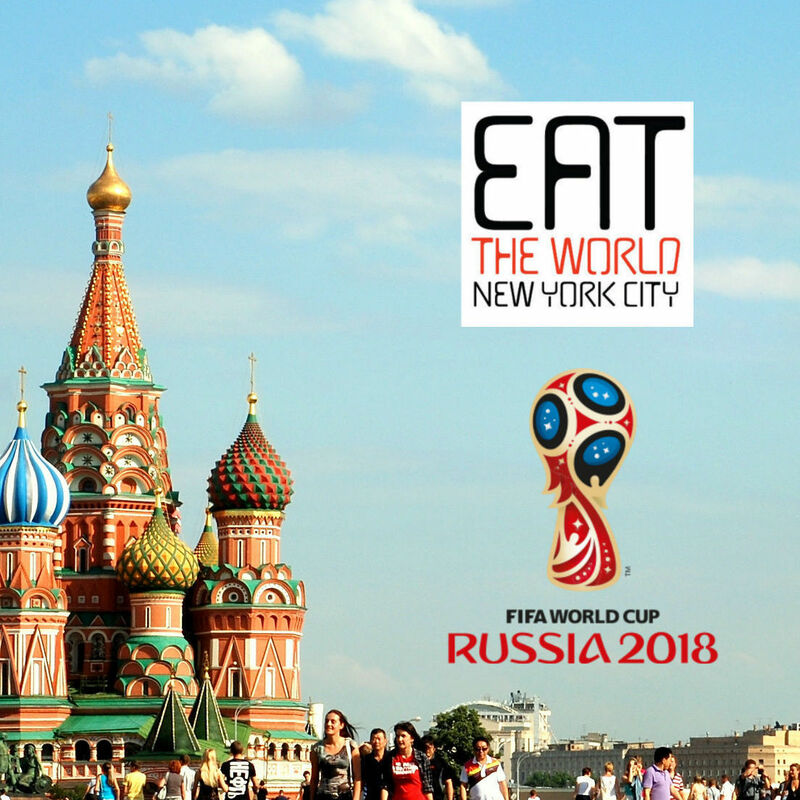 Having never strolled down this section of Third Avenue, it was new to me and now new to these pages, and of interest for anyone dedicated to seeking out the foods of Sierra Leone. 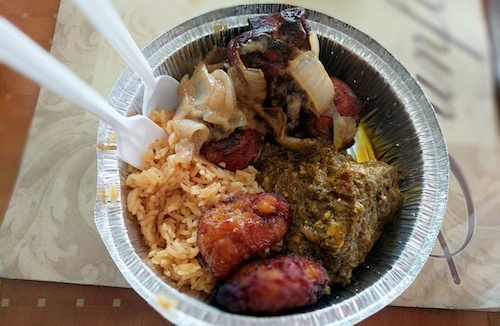 Surrounded by noisy auto shops and a West African market next door, Jalloh is a respite for sore feet and empty bellies. On days of agreeable weather, only a wooden screen door separates the interior from the street, creaking open and thwacking shut as customers come and go. These sounds conjure up a sleepy old rural country home and the people inside do little to intrude with these mental images. Not knowing if I should help myself, I had to basically wake someone up to ask. The system here, similar to many West African steam tables around the city, is one of self-service. Heap all the food you want to eat into takeout containers and have them weighed to get your price. Most customers, many of which are cabbies, grab quick plates to take with them, but there are always a few seats around for eating in as well. The cost per pound was not inquired about, but the plate above with jollof rice, chicken with mustard sauce, goat in root vegetable, and some sweet plantains came to only $6 even. To be fair to some of the amazing West African chefs around the city, the meats and sauces here were a bit of a step down, but the meal took place very late in the afternoon. At 12 noon, it could be guessed that everything would be at its peak freshness. That being said, the restaurant stays open 24 hours a day. Because of these hours, the place has taken on a fair bit of dirt and grime, but the steam table is immaculately taken care of even if the tables could use a wipe down. 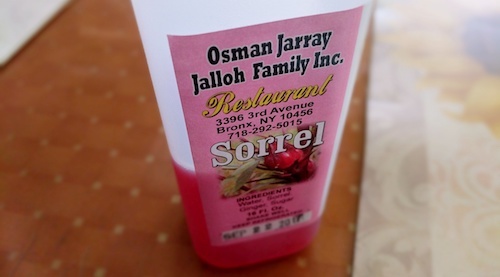 They have homemade sorrel ($2, above) and ginger juices, which are recommended to cut the generally oily nature of West African sauces. This delicious bottle went way too fast and had to be replenished. One large difference here is the presence of English, as this is the common and official language of Sierra Leone. Almost four-fifths of Sierra Leoneans practice Islam, and customers and staff still greet each other with "as-salamu alaykum" and big smiles. The restaurant obviously has a strong feeling of community and has proven this for at least a decade.